A tornado slides across Oklahoma. Image courtesy NSSL/NOAA. 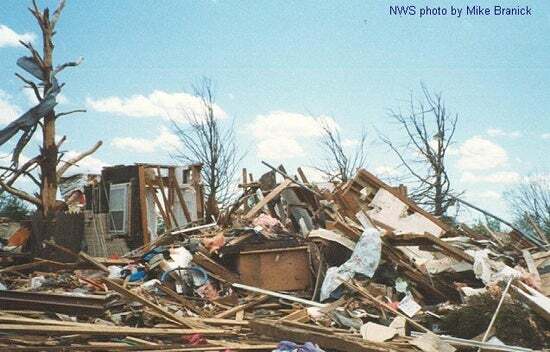 Continued vigilance and quick response to tornado watches and warnings are critical, since tornadoes can strike virtually anywhere at any time. Most tornadoes are abrupt at onset, short-lived and often obscured by rain or darkness. That's why it's so important to plan ahead. Every individual, family, and business should have a tornado emergency plan for their homes or places of work, and should learn how to protect themselves in cars, open country, and other situations that may arise. The most important step you can take to prepare for a tornado is to have a shelter plan in place. Where will you go when a tornado warning has been issued for your county or city? Is it a basement or a storm cellar? Is there an interior room on the ground floor that you can use as a storm shelter? Have a plan, and make sure everyone in your family or workplace knows it. Having a NOAA Weather Radio can save your life. Weather Radios are sold at many retailers and websites, including electronics, department, sporting goods and boating accessory stores. Or you can listen online. Conditions are right for tornadoes, and tornadoes are possible. Remain alert: watch the sky and tune in to NOAA Weather Radio, commercial radio, or a local television station in case a warning is issued. A tornado has been spotted by human eye or radar, and is moving toward you in the warning area. Take shelter immediately. Be alert to weather conditions. Listen to NOAA Weather Radio or tune in to a local television station for the latest information. When a tornado warning has been issued for your county or city, seek shelter immediately! A structure (residence, building, school, hospital, etc.) Head to your pre-designated shelter area. This could be a basement, storm cellar, or the lowest building level. If you are home and you don't have a basement, go to the most interior room of the ground floor. Often a bathroom or laundry room makes a suitable shelter area because the water pipes reenforce the walls, providing a more sturdy structure. Stay away from corners, windows, doors, and exterior walls. Put as many walls as possible between you and the outside. Get down on your knees and use your hands to protect your head and neck. Do not open windows. A vehicle If you can drive away from the tornado, do so. If you don't have time or not sure if you have time, or you're not sure which way the tornado is moving, get out of the vehicle. Head to the lowest floor of a nearby building or storm shelter. If there's no building or shelter nearby, follow the instructions for what to do if you're outside with no shelter. A mobile home or trailer Get out immediately and go to the lowest floor of a nearby building or storm shelter. 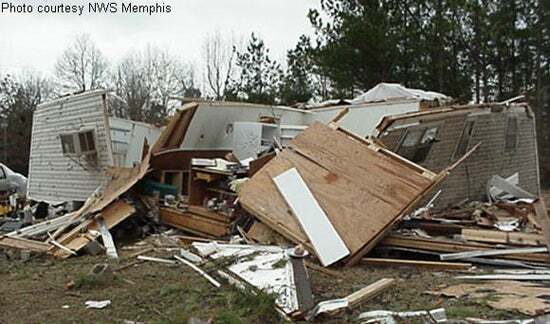 Mobile homes provide little to no protection against tornadoes. The outside with no nearby shelter Lie flat in a nearby ditch or depression and cover your head and neck with your hands. Be aware of the potential for flooding in the ditch you are occupying. Do not get under and overpass or bridge. You are safer in a low, flat location. If you are in an urban or congested area, do not try and outrun the tornado in your vehicle. Instead, leave the vehicle immediately and seek shelter. Be aware of flying debris. Tornadoes can pick up large objects and turn them into missiles. Flying debris cause the most tornado deaths. After a tornado passes, it is important to take some precautions. Be careful as your leave your tornado shelter, since there might be unseen damage waiting for you on the other side of doors. If your home has been damaged, walk carefully around the outside and check for things like loose power lines, gas leaks, and general structural damage. Leave the premises if you smell gas or if floodwaters exist around the building. Call your insurance agent and take pictures of the damage to your home or vehicle. If the destruction is extensive, don't panic. The American Red Cross and other volunteer agencies will arrive with food and water, and temporary housing will be designated by FEMA. 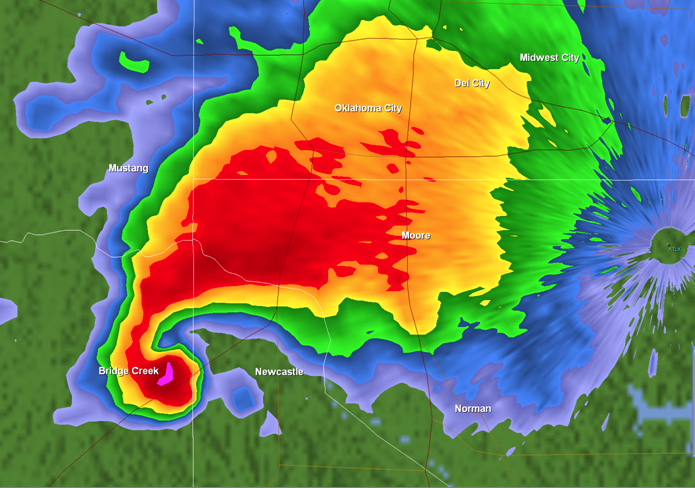 Reflectivity of the supercell that produced the Moore, Oklahoma tornado on May 3, 1999. At the time of this radar scan, a tornado was on the ground. Image courtesy NWS. A tornado is a violently rotating column of air which descends from a thunderstorm to the ground. No other weather phenomenon can match the fury and destructive power of tornadoes. Tornadoes can be strong enough to destroy large buildings or lift 20-ton railroad cars from the tracks. 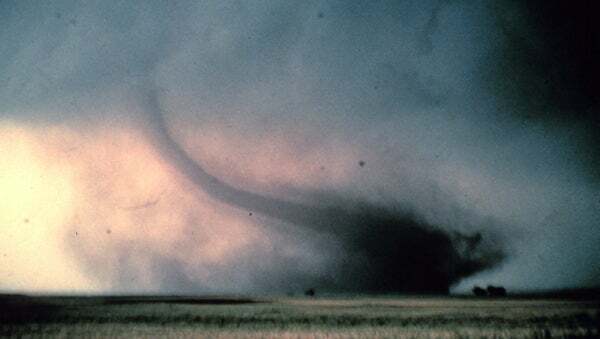 A tornado might not have a visible funnel until it picks up debris from the ground. The strength of a tornado is measured by the Enhanced Fujita Scale (continue scrolling for information on the Enhanced Fujita Scale). The truth is that scientists don't fully understand how tornadoes form. A parent supercell thunderstorm is needed. Beyond that, each storm is different. Some research suggests it has to do with how strongly the wind changes direction with height or how much moisture is in the air. Other research suggests it forms because of the difference between the temperature of the surrounding air and the temperature of the cold downdrafts coming from the storm. A supercell is an organized thunderstorm that contains a very strong, rotating updraft. This rotation helps to produce severe weather events such as large hail, strong downbursts and tornadoes. Supercells usually form isolated from other thunderstorms because it allows the storm more energy and moisture. These storms are relatively rare, but always a threat to life and property. A tornado begins as a rotating, funnel-shaped cloud extending from a thunderstorm cloud base, which meteorologists call a funnel cloud. A funnel cloud is made visible by cloud droplets, however, if the cloud lacks moistrue, it may appear to be invisible. A funnel cloud does not affect the ground. If the funnel extends far enough down to begin affecting the ground, then it becomes a tornado. How far does a tornado travel? Tornado paths range from 100 yards to 2.6 miles wide and rarely travel more than 15 miles, although some strong tornadoes on record have crossed through multiple states (e.g. the Tri-State Tornado of 1925). They can last from several seconds to more than an hour, but most don't exceed 10 minutes. Most tornadoes travel from the southwest to northeast with an average speed of 30 mph. However, observed speeds have been recorded between almost no motion and 70 mph. Tornadoes form under a certain set of weather conditions in which three very different types of air come together in a certain way. Near the ground lies a layer of warm and humid air, along with strong south winds. Colder air and strong west or southwest winds lie in the upper atmosphere. Temperature and moisture differences between the surface and the upper levels create what is called instability, a necessary ingredient for tornado formation. The change in wind speed and direction with height is known as wind shear. This wind shear is linked to the eventual development of rotation from which a tornado may form. Most tornadoes occur east of the Rocky Mountains in a region known as "Tornado Alley." The vast majorities of tornadoes occur in the deep south as well as the broad, relatively flat basin between the Rockies and the Appalachians, however no state is immune. 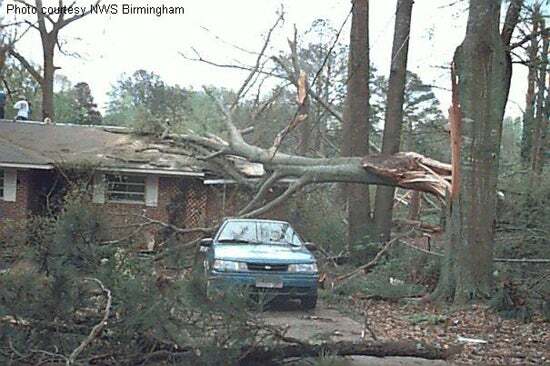 Often, the most dangerous tornadoes occur in the deep South and Southeast, where low visibility because of trees and hills lead to a false sense of security during severe weather outbreaks. Furthermore, the South and Southeast tends to be more heavily populated than the Plains states. This region has been given the nickname "Dixie Alley." Peak months of tornado activity in the U.S. are April, May, and June, but tornadoes have occurred in every month of the year. Although they are possible any time of the day or night, tornadoes tend to occur in the late afternoon and early evening hours, when the atmospheric conditions are most ripe for supercell thunderstorms. They are most common from 4pm to 9pm. Tornado Alley is so active with severe storms because of its unique location. Tornado Alley is a nickname given to the plains region of the U.S. that experiences a high frequency of tornadoes, many of which are violent tornadoes (classified as EF-3 or greater). With the Rocky Mountains to the west, and the warm waters of the Gulf of Mexico to the south, this region is in a ripe location to produce supercell thunderstorms. 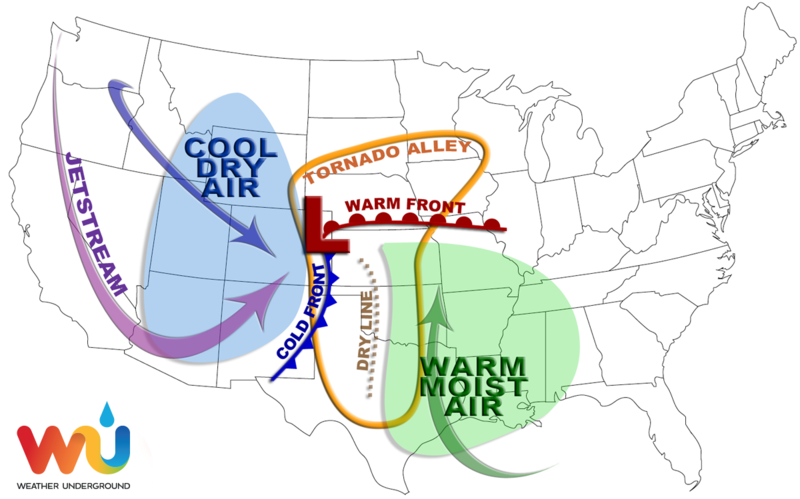 Midlatitude cyclones, like the one illustrated above with the red "L" and fronts, are the large-scale phenomena that spawn storms that create tornadoes. As midlatitude cyclones move eastward off the Rockies, they can tap into the warm, humid air from the Gulf of Mexico. This air surges northward at the low levels as cold, dry air at upper levels is pulled south by the storm. These are the basic ingredients for instability, which every thunderstorm needs to grow. Warm, moist air is less dense than cold, dry air. In this density game, the surface air will begin to rise, and in an unstable atmosphere, what goes up will keep going up. Air moving upward is what creates our clouds, rain, and our thunderstorms. If the upper-level jet stream is strong in this storm, the turning of the winds with height, or "wind shear," will aid in creating supercell thunderstorms and tornadoes are possible. All tornadoes are spawned from a parent supercell, but not all supercells produce tornadoes. Dr. T. Theodore Fujita developed the Fujita Tornado Damage Scale (F-Scale) to provide estimates of tornado strength based on damage surveys. 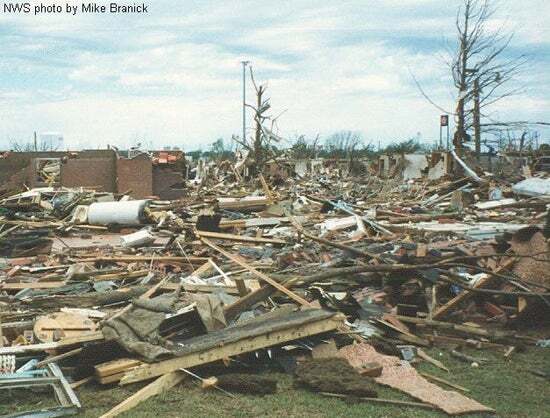 Since it's practically impossible to make direct measurements of tornado winds, an estimate of the winds based on damage is the best way to classify a tornado. The new Enhanced Fujita Scale (EF-Scale) addresses some of the limitations identified by meteorologists and engineers since the introduction of the Fujita Scale in 1971. The new scale identifies 28 different free standing structures most affected by tornadoes taking into account construction quality and maintenance. 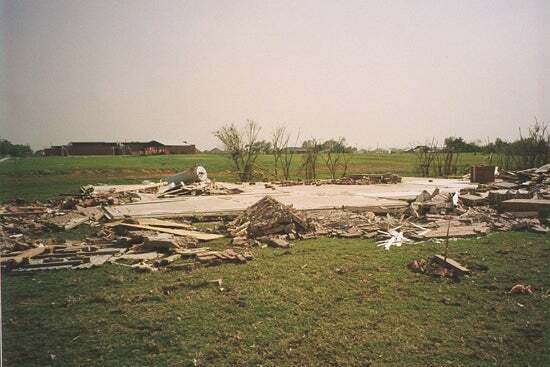 The range of tornado intensities remains as before, zero to five, with 'EF-0' being the weakest, associated with very little damage and 'EF-5' representing complete destruction, which was the case in Greensburg, Kansas on May 4, 2007, the first tornado classified as 'EF-5'. The EF scale was adopted on February 1, 2007. 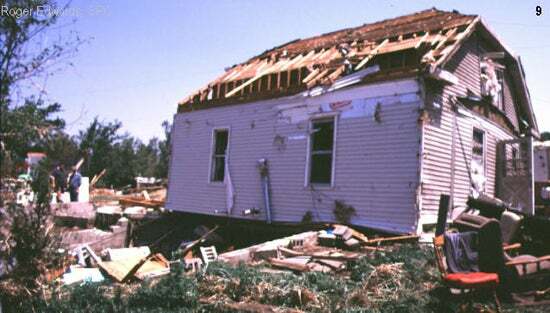 EF-4 (166-200 mph) F4 (207-260 Devastating damage. Whole frame houses Well-constructed houses and whole frame houses completely leveled; cars thrown and small missiles generated.